Have you noticed the recent collaboration of The Faceshop and Kakao Talk? These ohh so kawaii collaboration offers the complete sets of makeup and skincare (honestly those face mask are cute too!). 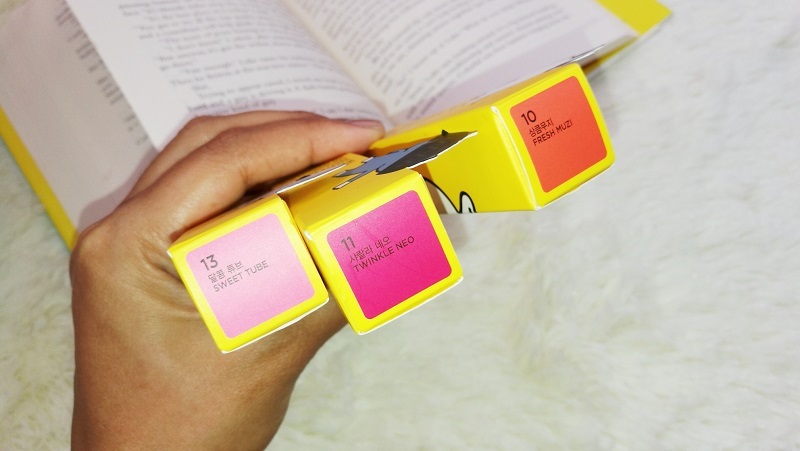 So my main target is to grab the full collection of Kakao Friends Lip Creamer, unfortunately only three shades are available: No.10 – Fresh Muzi, No.11 – Twinkle Neo, and No.13 Sweet Tube. I was so excited to try make some swatches and photographs, and of course use it for my own satisfaction. After all its Kakao! These lip-creamers are so creamy it is easy to apply to my lips. It also smells like cherries which are very enticing but it doesn’t taste anything. These shades truly compliments my lips and my tan complexion. Could wear it for day and night time, and even for everyday wear! It’s fantastic, and not too flashy. 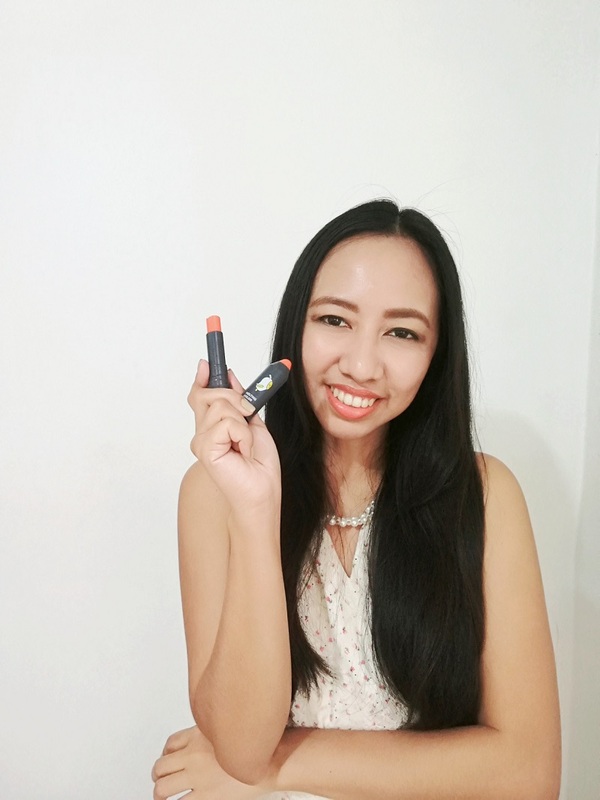 Are you also the type of lipstick junkie who always misplaced her lipstick, or worst accidentally removed its cap, and smudge all your lipcolor inside your bag or purse? I bet these lip creamer will be your type. 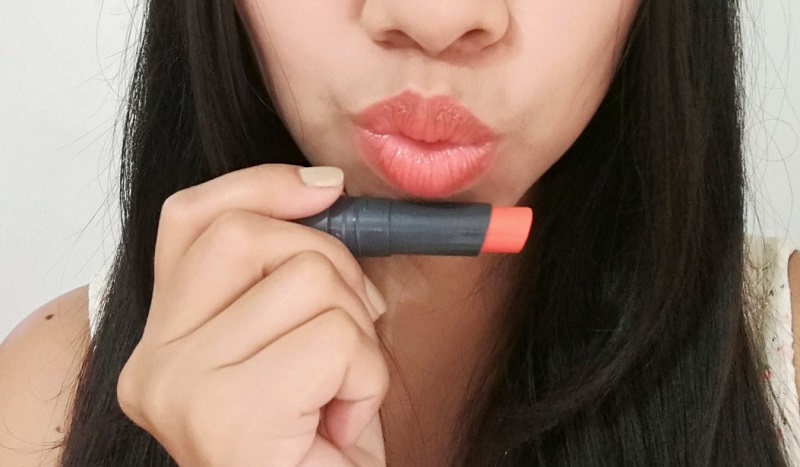 It has a well twist-type cap that will eliminates your problem of accidentally uncapped lipsticks. When you screw it right, it was so tight it won’t smudge all over your bag. I haven’t seen other lipstick brands who have that twist-type cap. Shades are well blended to my Morena complexion and I bet it will look radiant for some with fair complexion. I don’t need to wear glosses for these lipstick coz its already creamy and gives my lips extra moisture. You just have to be extra careful when applying these lipstick. Because they are extra soft, when you accidentally give pressure during application, t will easily deform its shape. Well, I think that would be not much of a problem. If it gets deformed, you may easily transfer it to your palette container. I did it to my other deformed lipsticks, especially when I reaaalllly love the shades. Actually, since these lip creamers are extra soft, you may also use these as your alternative cheek tint! Yeah I know its crazzyyy but when I tried it – gosh it perfectly blends to my cheeks! And to be honest, it is quite a lot better compared to my current blush-on. And it saves me weight from bag. I don’t need to bring my blush-on, and just bring these lippies with me. Sometimes I even use these to have that igari-look. You can also use this as your tint for your eyelids! 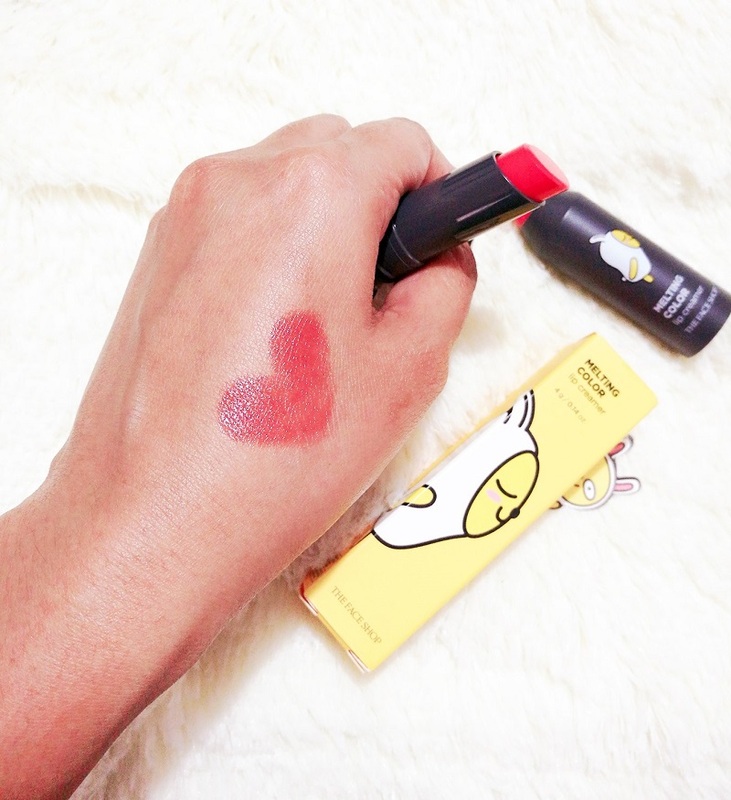 Saves you from buying other cheek-lip-eyelids tint! 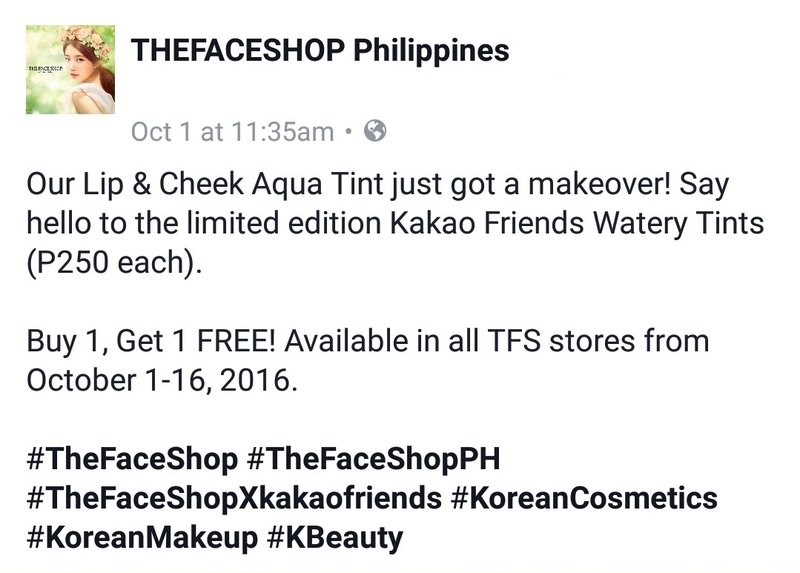 Kakao Friends x The Faceshop makeup line collaboration is available in all The Faceshop outlet here in the Philippines. You may also check it online for the complete shades. 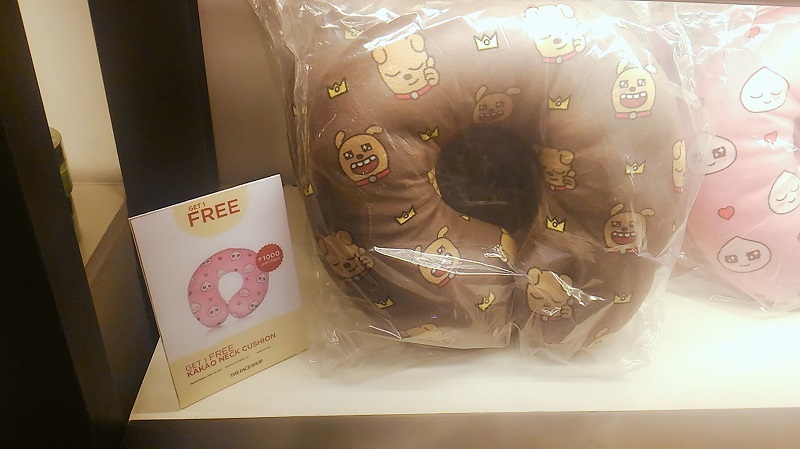 Oh by the way, for every Php1000 worth of purchase, you can get a free travel pillow with you! Have you tried these lip creamers from The Faceshop? Isn’t their packaging so adorable? I would love to hear your thoughts! 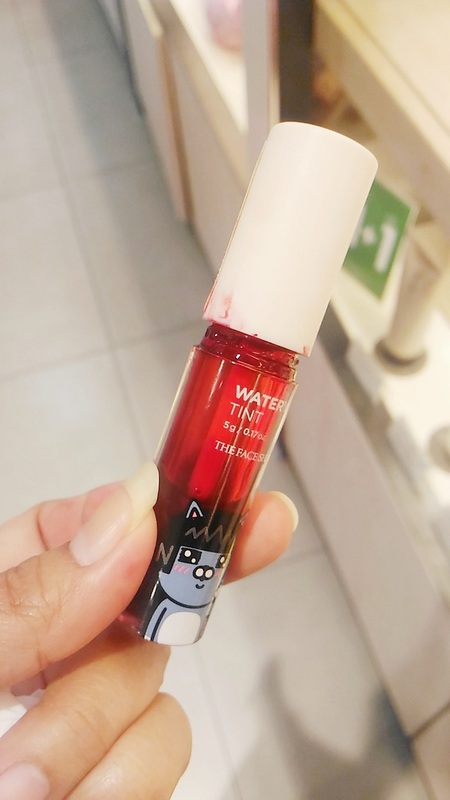 These Lip + Cheek Watery Tint are very easy to blend and also smells like cherries and really slippery to the lips. You just put a dap of it on your lips and start blending it. 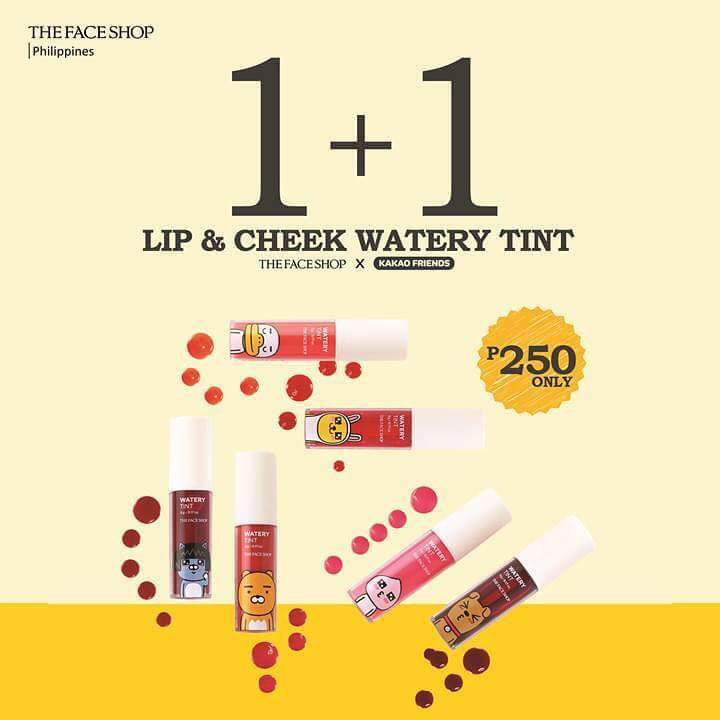 It has four (4) shades, but when we visit the The Faceshop at Bonifacio High Street branch yesterday, the other 2 shades are already SOLD-OUT. Starting from October 1 to 16, 2016 - You can grab one for this at Php250 (approx. $5.20) and get the same product (or you can choose different shades) for FREE! I was supposed to grab these watery tints, but when I tried it I suddenly changed my mind.. Why? Take a look at the photo above... in case you'll not close it tightly, the tint per se will smudge outside its container. And the cap is not so secured, unlike the lip creamers. So if you are careless, these will lead to a total mess in your purses or even in your makeup kits. No wonder this is on SALE. But the formula is also good and gives that promised tint, but also easily fades away. You may grab these tint, and give it to your friends as gifts! You can grab this and make as a "training lipgloss" for your daughters and nieces. Just be extra careful for the mess in case it will uncapped. This is too cute!! Oh I love kawaii and I love lipbalms/ lipaticks. This is really nice and I want them too haha. Definitely going to look up if I can order. Great shades! Thank you Carola :) Grab some and let us know your experience! I haven't tried any product from The Face Shop yet. I really need to pay a visit soon! I think you should try... try first their items not too expensive, so that you won't be overwhelmed. They are one of the Korean beauty brands that I like, coz they have no harsh chemicals. I like all the shades. So pretty! And I love that training lipgloss. My nine-year-old would love it. Yeah, in my opinion it is okay for parents to at least give a chance kids to try these things, little by little so that they won't feel secluded. They will like it. I really hope ladies have grabbed something from this. I have not tried this product but love items that make my lips look nicer and feel softer. I was wondering what this post was about as Kakao is the German word for hot chocolate. Glad you like my review. Yeah, kakao is also mean chocolate in our local Filipino language, and German too! However, its quite unusual for Korean label to use the name. I'm not sure really why they name it as Kakao, LOL. 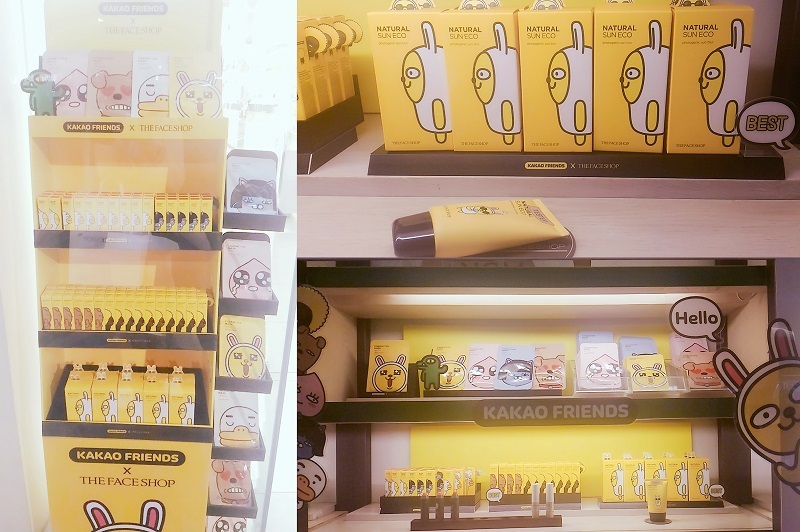 Kakao is also called Kakao Talk, a mobile messaging app just like WeChat and Whatapp, and those Kakao Friends (animated characters) are like its mascots :D They are HUGE in Korea! Great post about new products. Need to check the availability. You can check it via The Faceshop website, and I believe they ship internationally. This is so cool. 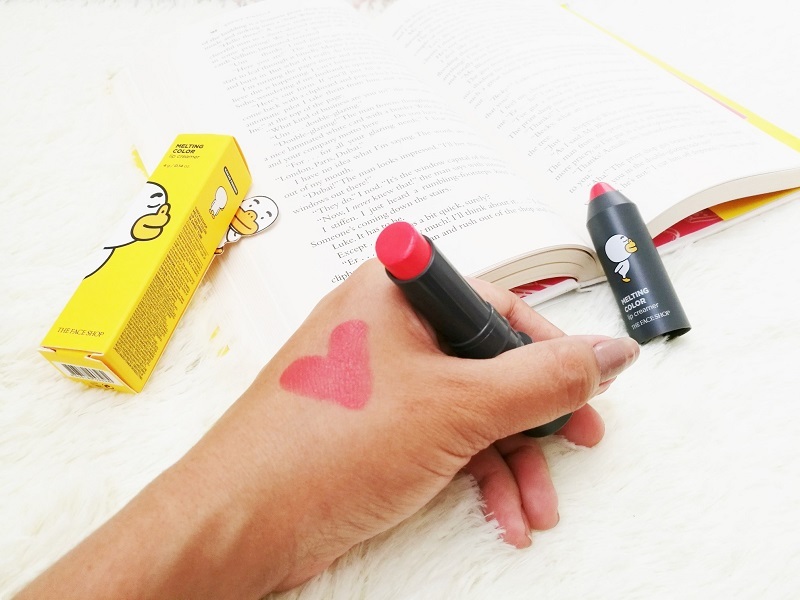 I am obsessed with amazing lip colour and lip balms. I think I cannot stay with out a lip balm at all. I will surely check this great Collection. You always find the coolest make-up stuff. How do you do it? Maybe because I like sharing new beauty trends that I have strong feeling that most ladies will like. So at least 3 times in a week, I visit the nearest beauty stores in the city, to check the latest items. Then also I have a habit of reading online beauty websites in the morning, hahaha. As a beauty blogger, I also do research ahead, just to make my readers stay updated with the latest trends, and sales! Oh my gosh the packaging looks so cute! I love the color options too! Thank you Marie! You will also like their other collection, and their skincare line. I've never heard of this line however I LOVE lipstick. The color looks great on you and I love how they try to make it friendly for the women wearing it by design. I have never heard of this makeup line! Those lip creams are so pretty! Makes me want to go find them and try them! The product is new to me and not yet seen here, but seeing the shades I am eager to try out. :) Great offer of pillow with it. Thank you Arisa! These are just my recent purchase and I haven't bought new ones.. am trying to save! Such beautiful lipstick shades. I also am attracted to the packaging. Let me see if I can find them in Ipoh! Ohh definitely you'll find it coz this collection is not rare. Do share us your review soon! Product look good and nice. Want to try too. 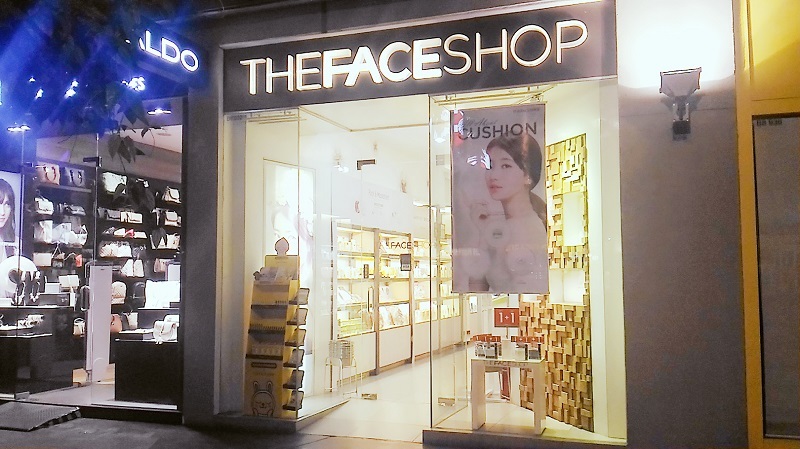 The Face Shop has a great range of products (the one you mentioned is adorably packaged too) and their skincare in particular is greatly known as well. You should give a go on their anti-aging line, that one is pretty spectacular in its own way too. And the great thing about this packaging is, you can closed it tightly and not worrying of missing the cap. Thank you for visiting Meira, yeah visit The Faceshop, and I guess these are more cheaper to your area. OMG! The packaging is just so quite and yeap that tint colour payoff. Is it long lasting? it last for 4 hours to me, and you need to re-apply again. But once it creamy lipstick is gone to your lips, it leave a tint color, which is awesome! So sometimes my second application is just a gloss. I liked some of the shades. Might consider to try this product. oh please do, these are worthy to your collection. Omg. I love the casing, it look so cool and the color also not bad. Will it be available in Malaysia? They are just too cute! 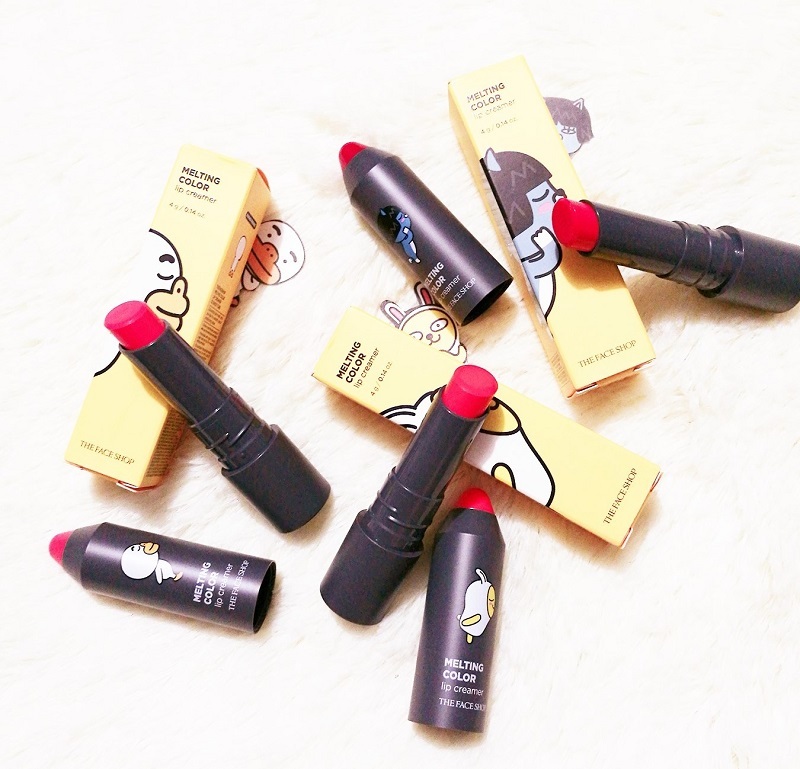 I will include this on my list and buy for sure, perfect timing that I read about it because my lip tint is almost "dead"
I love the packaging and colors too, but have not try this range yet. Oh you must, if you are also a fan of blush, you will like this lip creamer - multifunctional! Oh I have lipstick galore! But like they say, it's okay for a women to have a huge collection of lipstick - it is a woman's weapon, plus a tiny thing that wouldn't make us look fat.